To the northern hemisphere of the world, last Tuesday was the longest day of the year, the summer solstice. But more specifically to Canadians, it was the 20th National Aboriginal Day. Since 1996, the 21st of June has marked the national Aboriginal day. For decades, Indigenous communities celebrated their heritage on this day due to the significance of it being the summer solstice. The date became a milestone for Canadians to celebrate the culture and achievements of the First Nations, Métis, and Inuit people. With such a long legacy, it was only natural to see Indigenous art and history making its mark on flags in Canada. One of the iconic Indigenous flags is the Métis Nation flag. Its beauty is in its simplicity and depth. With an infinity symbol before a blue background, the symbol represents the joining of two cultures, the Indigenous and the European. 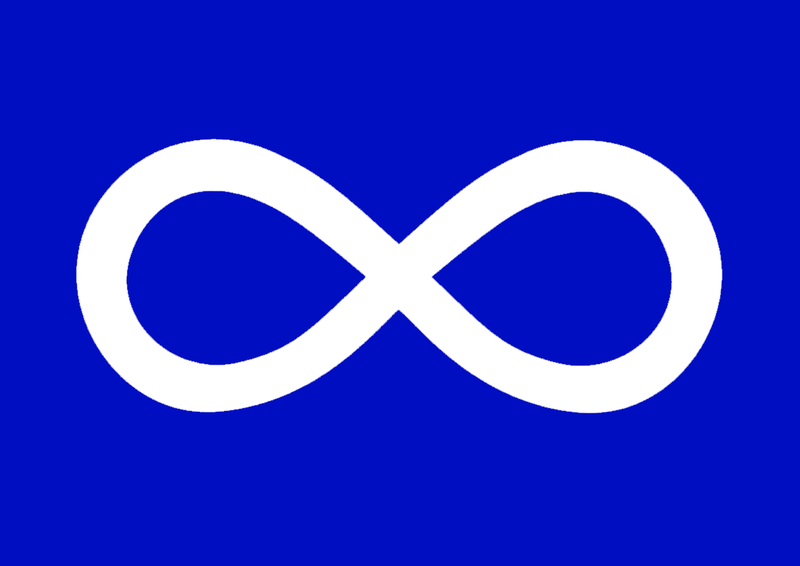 The symbol also represents the infinity in belief that the Métis culture shall live forever. When Nunavut officially became a Canadian territory in 1999, the first order of business was adopting a unique flag. Visually, the Nunavut flag is definitely the most Indigenous among all the Canadian provinces and territories. 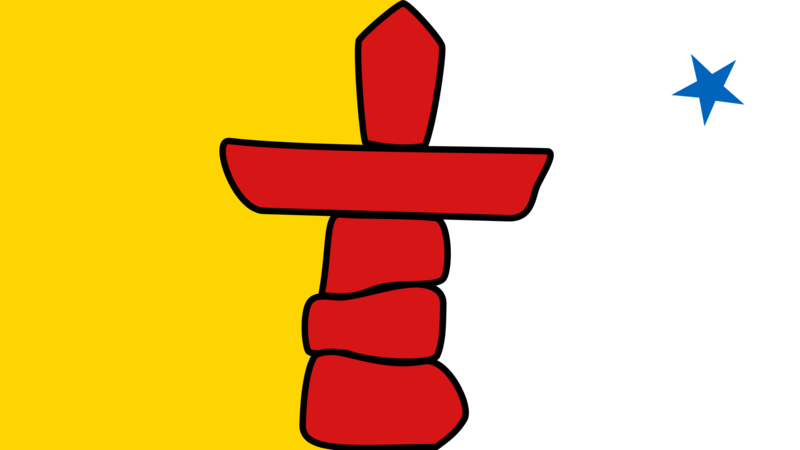 With a striking yellow and white background, the symbolic Inuksuk stone monument takes the centre of the flag. Historically, the Inuksuk guided people to their land, and marked sacred and special places in Indigenous communities. 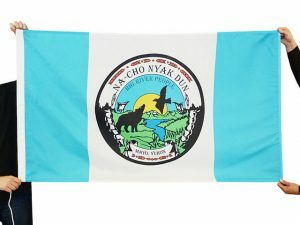 On the right corner of the flag is the North Star, a traditional guide for navigation and a symbol of elders’ leadership in the community. 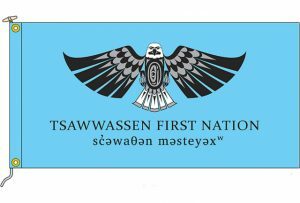 One of our proudest moments was when Susan Braverman, the president of The Flag Shop, worked with Curtis to bring his design for a flag to represent First Nations in Canada to the public. The Flag Shop is the manufacturer and exclusive distributor of this flag. Not only it is a beautiful flag, but it’s also a symbol of a unified Canada that revels on diversity. Our relationship with Indigenous flags and events go back farther than the first National Aboriginal Day in 1996. 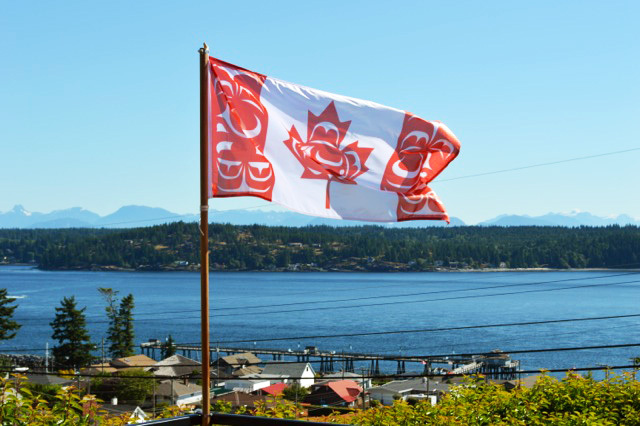 From manufacturing the flags for the Stó:lō nation in Chilliwack, to the iconic flag of the Tsawwassen First Nation, to the beautiful Na-Cho Nyak Dun First Nation flag in Yukon. Our relationship with the Indigenous nations goes back to the 1970’s. Most recently, we produced flags and banners for the North American Indigenous games that took place in Regina, Saskatchewan. It was a proud moment for many Indigenous young athletes to carry these flags up high, and it brought us a lot of joy to say that we were part of these special moments. Making flags means being a part of something, and for that we are proud to be a part of the rich and diverse Indigenous community of Canada. When Guardians of the Children called The Flag Shop, they knew they wanted motorcycle flags that were both cost effective and quality. After hearing about what Guardians of the Children stand for, The Flag Shop President, Susan Braverman, wasn’t w illing to just sell the biker group some flags; she wanted to go above and beyond their expectations. By reaching out to her network in the industry and pulling some strings in our production department, Susan not only found a way to make custom motorcycle flags for the Guardians of the Children, but she was also able to design and create custom friendship pins for the biker group! We were excited to help such a unique cause! Why? Because at The Flag Shop, our goal is to change the world one flag at a time! So who exactly are Guardians of the Children? 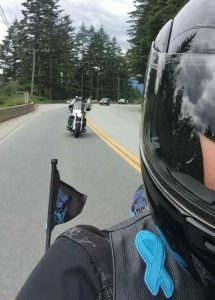 “We’re a group of bikers on a mission to power the children,” said “Mama Bear”, member of Guardians of the Children’s Vancouver chapter who asked to be anonymous. Yes, you read that correctly. Guardians of the Children are an international group of bikers on a mission to protect children from abuse. The group started with its San Antonio, Texas chapter in 2006, then Winnipeg started the first Canadian chapter in 2014, and in January of this year, a chapter opened up in Vancouver. What better way to change the world than to make products for a group of bikers that protects children from abuse?! In fact, we loved the cause so much that we gave Guardians of the Children a hefty discount on their purchase of custom motorcycle flags and friendship pins. 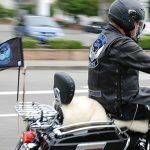 On June 12th, Guardians of the Children embarked on an International Pledge Ride to spread awareness of their cause, and pledge commitment to the children. And guess what went along for the ride? The amazing flags and pins from The Flag Shop! The pins aren’t just any pins… they’re friendship pins! 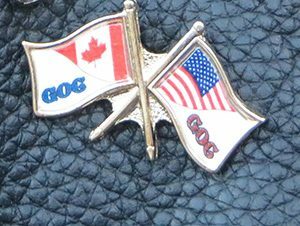 “The friendship pins represent a united brother and sisterhood between Canadian and American Guardians of the Children chapters. They are also meant to support the mission of the Guardians,” said “Mama Bear”. The Vancouver chapter gifted some of the friendship pins to a chapter in Washington recently. “Mama Bear” hopes to continue sharing the pins to other American chapters as well. As for the flags? The flags showcase the Guardians of the Children’s mission to protect the children, spread awareness about child abuse, and prevent bullying. 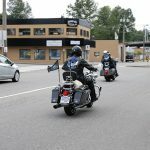 The black and blue flags waved across the highway on June 12th for the Guardians of the Children’s International Pledge Ride! I think it goes without saying that we love working with causes! Are you looking for ways to showcase your unique cause? Contact your nearest Flag Shop to chat with a member of our team! You are currently browsing the The Flag Shop Blog blog archives for June, 2016.